Skagway is on the itinerary of just about every cruise ship sailing Alaska’s interior passage. Ours was no exception. 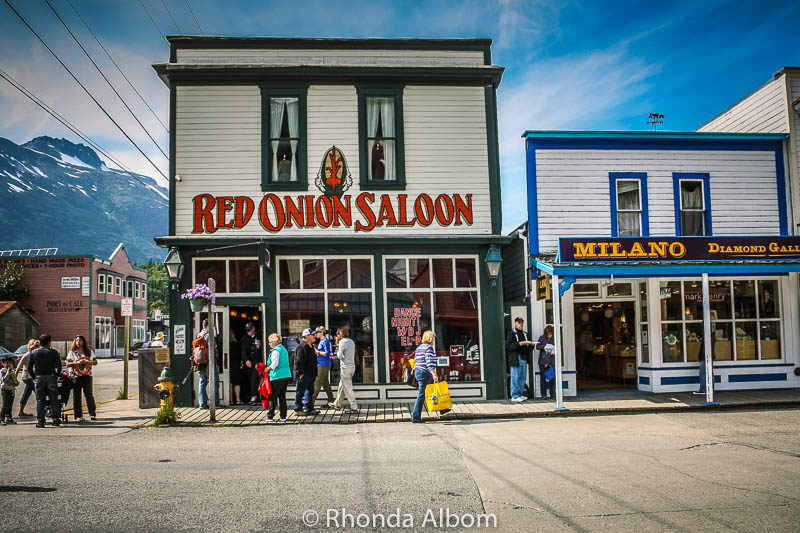 There are more things to do in Skagway than hours ashore in this former gold rush town. The options range from expensive Skagway Alaska excursions to free tours, hikes and other mini adventures. 6 Have you been to Skagway? 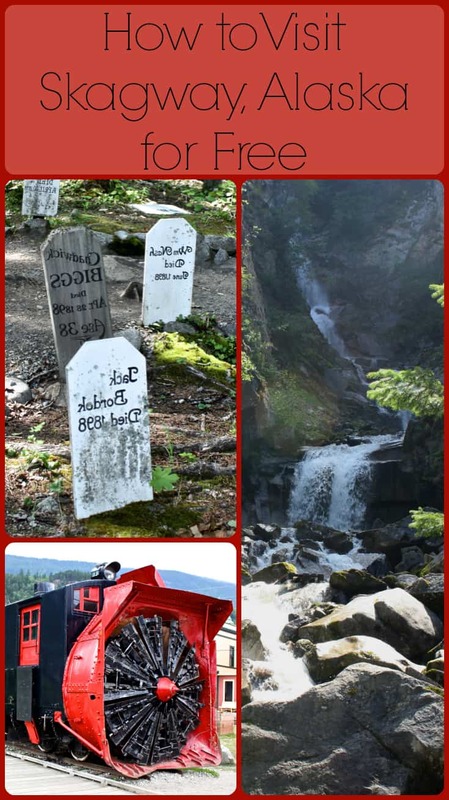 Are there enough things to do in Skagway to keep you busy? 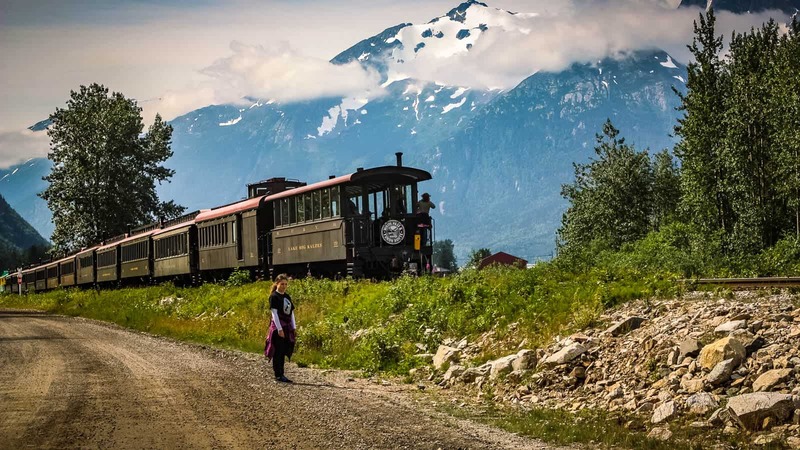 Some of the best Skagway excursions include riding the famous White Pass Railroad, dogsledding, or enjoying a traditional Alaskan Salmon bake. If you don’t have deep pockets, or if none of these options appeals, there are more than enough free, or nearly free things to do in Skagway. However, if you are arriving in Skagway on a cruise ship you will want to maximize your limited time in the city. After you explore the shore excursion options provided by your ship, check out some of these independent options from Viator, a TripAdvisor company. Smaller groups and lower prices are the two primary reasons we prefer to take independent tours. Be sure to read about Viator’s worry-free shore excursion guarantee. ⇒ If you’re still in the planning process click here for current specials offered by Princess Cruise lines. We opted to skip the excursions as we had already spent 16 hours on trains in Alaska, had landed on Fox Glacier in New Zealand a few years earlier, saw the husky dogs in Denali, and I am terrified of zip-lining. Sitting right at the end of Broadway it would be difficult not to see this ice cutting train car on display as you walk into town from the port of Skagway. Winter in Alaska is harsh. I can imagine this snow and ice cutter car was well used. Located in the historic Arctic Brotherhood Hall (Notice the AB on the front), the Skagway Visitor Center is now a destination on its own. The exterior pattern is made from over 8,000 pieces of driftwood. One look and you know why this is considered to be Alaska’s most photographed building. Going inside, we were able to get maps and information on all the things to do in Skagway. Each morning at 10 am, the Park Rangers offer a 45-minute talk on various topics. The day we were there, the topic was Gardening in Skagway, so we opted to skip it. There is also a free daily 30-minute film on the history of Skagway. Both are at the Ranger Visitor Station (2nd and Broadway). We like to turn off the main streets, leave the tourist area, and get the real feel of a town. Had we not done this, we never would have seen this garage. 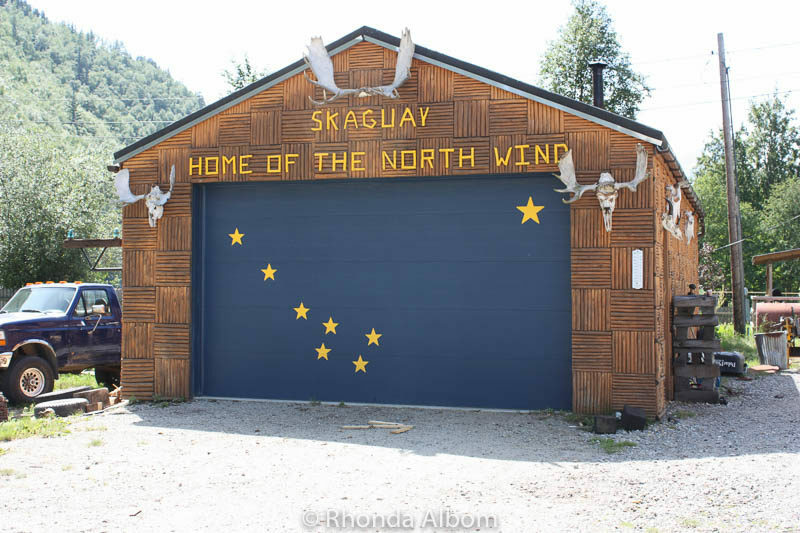 A private garage door in Skagway, a city formerly spelt Skaguay, but the post office made the town change the spelling. The library opens daily at noon, but the Wifi was available just outside starting at 10 am (8th and State). A crowd of locals sitting on the benches alerted us to this freebie. 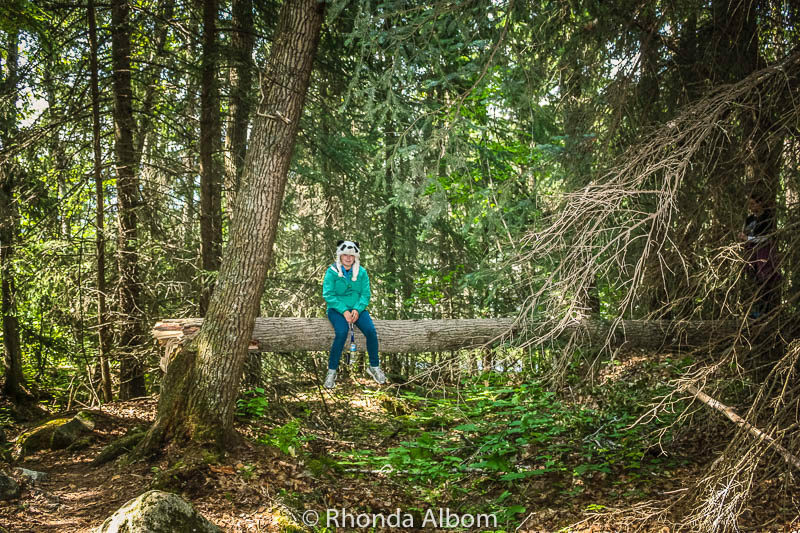 The lush green forested area offers lots of hiking opportunities, my favourite of the things to do in Skagway. I don’t know why, but I found these old train springs to be fascinating. This is what hiking with teens looks like. I am not sure why we opted to skip both of these hikes. The first, an easy walk to Yakutania Point provides a lovely view of the Skagway port and inlet as well as our cruise ship. We were told later that there were whales in the bay on the day we were docked. The hike to Dewey Lake is considered to be more challenging than Yakutania Point. However, once there it is an easy walk around Dewey Lake. 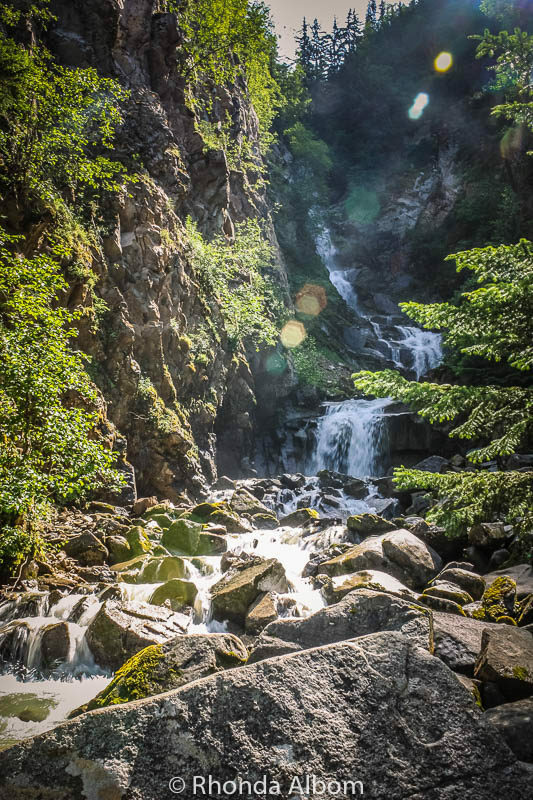 Hiking is one of the great things to do in Alaska in summer. 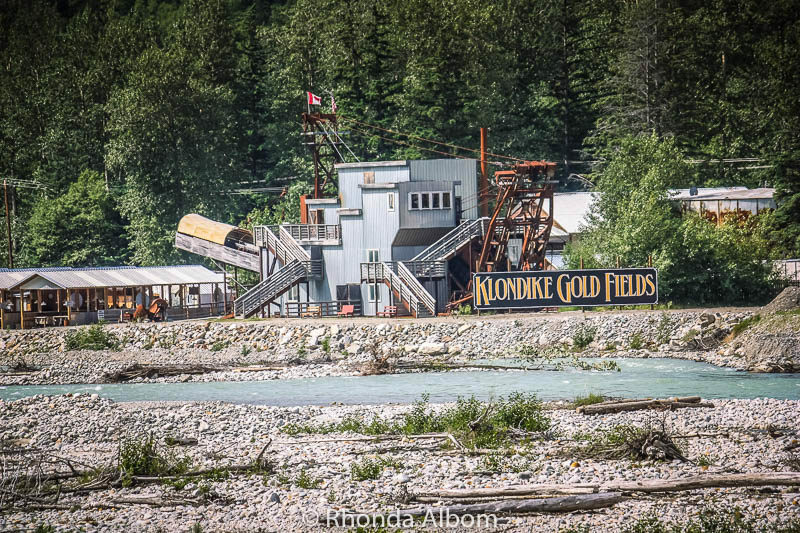 Skagway was a sleepy town until word got out about gold in the late 1890s. For less than two years the town boomed, growing faster than the infrastructure and without enough doctors. Typhoid, meningitis, and lawlessness wiped out most of those buried here, and the majority of the grave markers we saw are dated 1898. 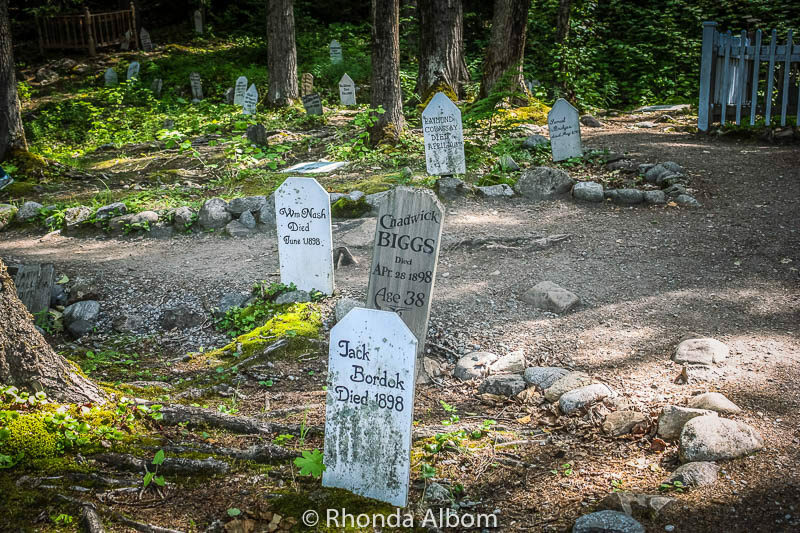 The cemetery is about 2 miles from the port of Skagway. Walking less than a half mile beyond the cemetery, we came to Ried waterfall cascading over the rocks much faster than I would have expected. Ried Waterfall in the sunlight. We did not pan for gold; we just had a look from a distance. I am sure this is not a free or near free activity, but one that we passed by as we walked to the Gold Field Cemetery. A bit farther from town is the larger Lairsville Goldrush Camp. We discovered the Klondike Cafe, a great little coffee shop. We are coffee drinkers, but others told us the most refreshing beverage in town is a Spruce Tip Ale from the Skagway Brewing Company. Numbers are limited, so you need to pick up your tickets at the Ranger Visitor Station. The tour went through the heart of town and was under an hour and very educational. We are not shoppers. We travel light and buy almost no souvenirs. However, it’s always fun to window shop along Broadway, the main street. The Native American crafts are plentiful, plus we found some totem poles. Totem poles outside a shop on Broadway. More gold rush history, and gold nuggets. It was an interesting, although not terribly photogenic place to visit. We ran out of time and didn’t visit the sculpture garden next door to the museum. 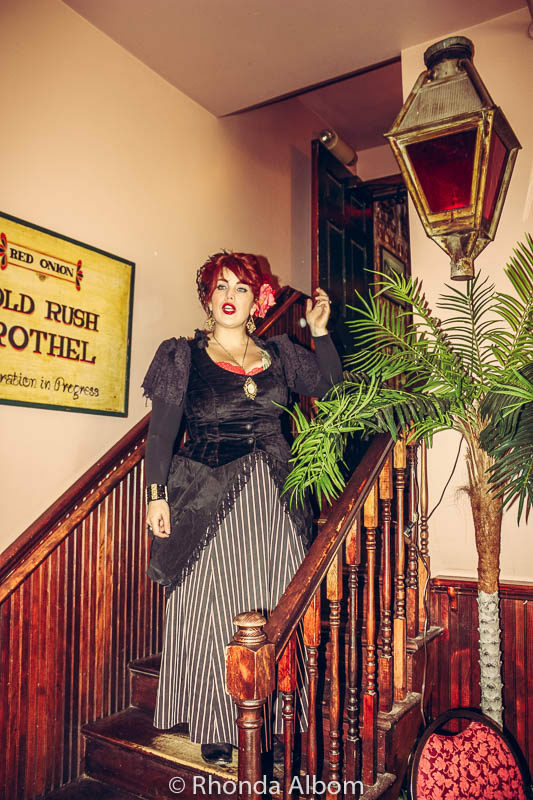 Head upstairs in the Red Onion for an innuendo-laden tour of one of the 70 former brothels in Skagway from the days of the gold rush. Some 15,000 men flooded the town in hopes of finding their fortune. In reality, no gold was found in Skagway. The madams may have been the most well-off in the town as they kept half of the girls’ earnings. The working girls charged $5 for 15 minutes of “service”. This was more than a miner’s daily wage. (There was a small charge for this tour). The Red Onion Saloon and Brothel, built in 1898. Our guide calling our small group for the brothel tour. 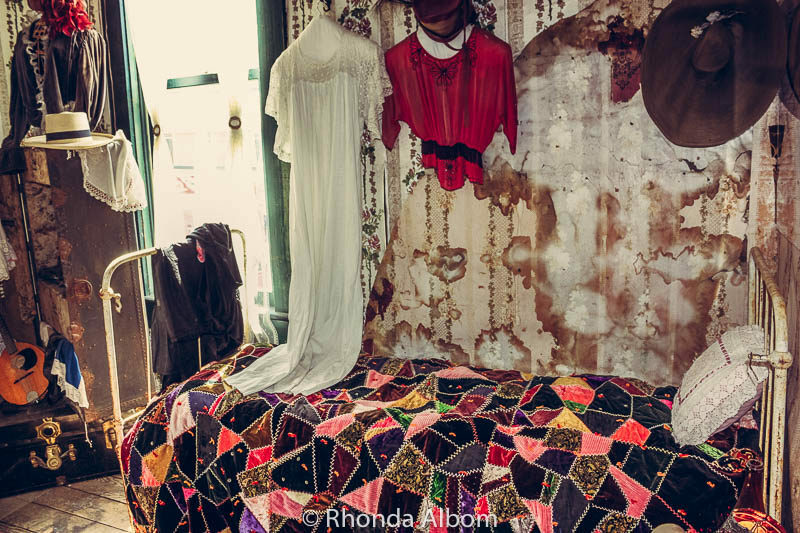 The girls lived and worked in their bedrooms. It’s a very short walk from the Skagway cruise port into town. There is a city shuttle bus that drives around Skagway offering $5 on/off all day. Should you be visiting on July 4th, head to Pullen Creek for the annual Skagway Rubber Duck Derby. If you are there in salmon season, Pullen Creek is also a great place to see the salmon run. If you are taking the White Pass Railway try to get a seat on the left side of the train for the best uphill views. Also, for the best photographs, walk out between the cars. Don’t forget to check Viator to save money on Skagway cruise excursions. We visited Skagway as a cruise port. However, if we went back, we would stay longer. Our first choice for accommodation is the Historic Skagway Inn. 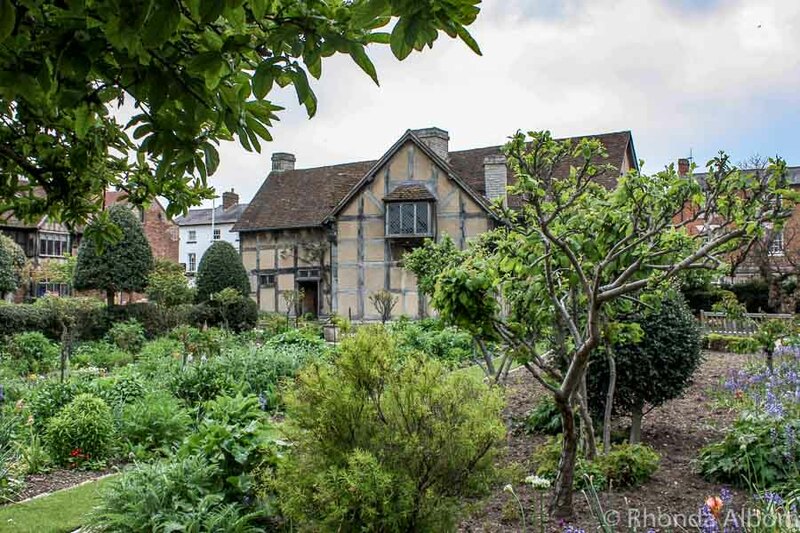 This charming bed and breakfast is highly sought after so be sure to book well in advance. Our second choice would be the centrally located Westmark Skagway Inn, rated as the best value in the city. Have you been to Skagway? 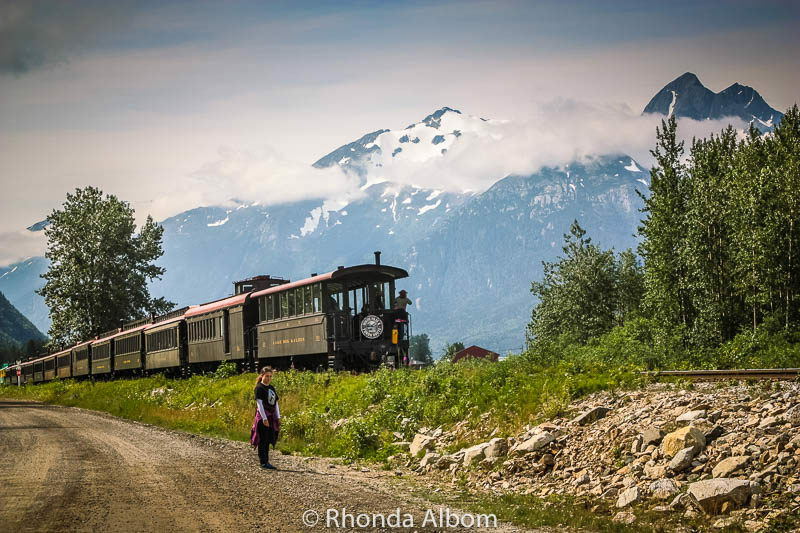 Are there enough things to do in Skagway to keep you busy? About how far is it to the waterfalls from the Cruise ship ? It wasn’t terribly far, as we don’t do the really long walks. Google maps show it as a bit over 2 miles from the port to the waterfalls. Wow! The Ried waterfall seems breathtaking, Rhonda! Is it possible to swim there? I don’t know, but if it is allowed, I would imagine it is quite cold. Never heard of Skagway before, but Alaska has always intrigued me. That Skagway Visitor Center looks phenomenal, can’t believe it’s just driftwood. 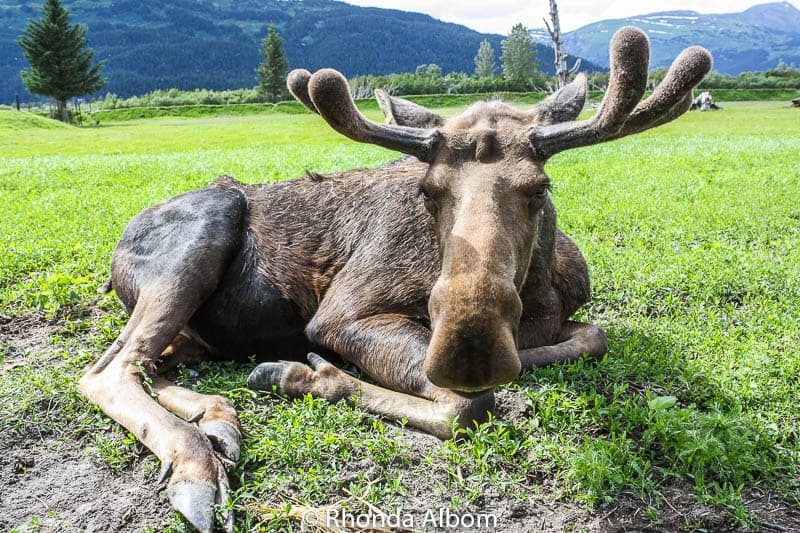 Alaska really does seem a great place to get in touch with nature. It’s not just driftwood, it is covered with driftwood. Sorry for the confusion. Lovely pictures and useful tips. Hope to visit some day. Thanks. I hope you get there. I think your list of free things to do would keep us busy all day. I can’t see us paying for an expensive tour. I love the look of the country and those buildings are so cute they don’t look real! If you have never been on a train in Alaska, the White Pass might be the way to go, even though it is expensive. The place seems to be amazing. The train looks stunning. I think, it would be fun to watch it in working condition. The waterfall looks beautiful. I love Alaska. Everything we saw was lovely, the waterfalls, the trains, the snowcapped mountains. We went to Alaska this past winter for the first time and absolutely fell in love with it there! We didn’t go on a cruise or make it to Skagway, but we will definitely have to add it to our list for our next trip there! Sounds like a fantastic place. I would love to do some of the hiking in the area and Ried Waterfall looks beautiful! I am not sure I would want to go to Alaska in the winter. I am a summer girl. That seems like a lot more than I would expect in Skagway! I think the history would be nice, but some of the scenery you can hike through is just amazing. That waterfall would be tops on our list. Thanks for opening our eyes! I was a bit surprised too. But when we get off the beaten path, and look around, there is usually plenty to do. So many possibilities, they look amazing and all free, that’s great! Hope you had a great weekend and all the best for this new week! All free or nearly free. We did pay a token amount for the brothel tour, but it was too unique to skip. Great write up- goes to show that there’s always something for everyone in each place, even if you don’t like doing the traditionally adventurous activities popular in an area. Skagway reminds me so much of the neighbouring Yukon! I would love to explore the Yukon someday. I’m so happy I stumbled across your article. We’re hoping to do an Alaskan cruise next fall. We usually opt not to do the cruise ship excursions and rather explore the ports solo. This detailed guide is absolutely perfect and there’s more than enough to do to fill a full day. Excellent tip about the hiking trails and the free Ranger-led walking tour, two activities that would top my list. Hoping to have enough time to visit Skagway Brewing Company and try their Spruce Tip Ale! If not on a cruise, I can see wanting to spend a least a few days in Skagway. You are going to feel that way about every port. Alaska is really special, quite magical. Remember to read the comments on this post too, as we missed the salmon. this is a great post. I’m sure lots of people pay for those more expensive excursions because they don’t know what else to do. This is very helpful and some of those things look fun and interesting. True, plus many people who cruise are not confident to do it themselves. This place looks like a movie set of a western movie. I would love to go there and see the salmon run. I bet the salmon is delicious there. I thought the buildings had that feel to them too, with the tall facade in front. I love the “Utilise the Free Wifi at the Library” hahaha. I need that! And yes, I love free tours or ways to explore. One must be aware that when you travel, you don’t have to always shell out a lot of money to explore the place! We needed the free wifi, we were on a cruise ship. David and I drove to Skagway from Whitehorse. It was a last minute decision but we are so glad we did it. It is a fascinating town. 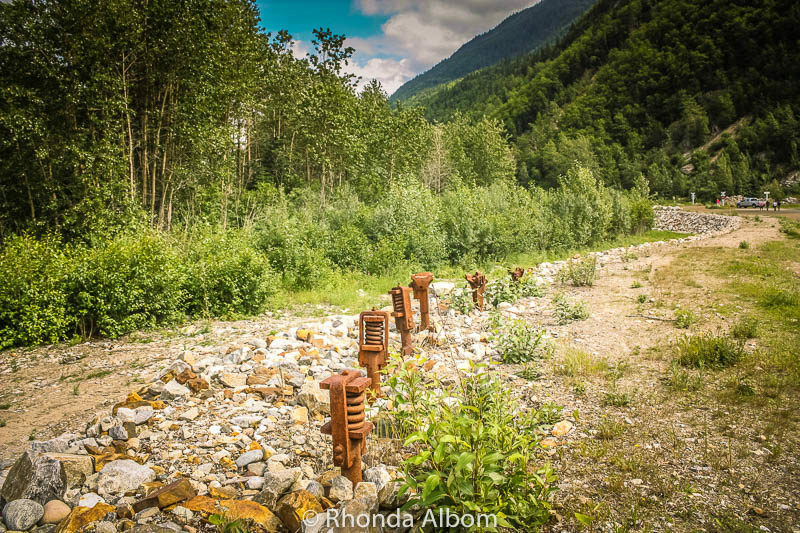 Because we had a car we were able to reach the old gold mining town of Dyea, near the beginning of the Chilkoot Trail. There is almost nothing left of what was once a boom town but there are plenty of ghosts and lots of adtmosphere. I would love to have had a car, and more time when we were in Alaska. Maybe next time. Thanks for sharing this Jim. I don’t know anything about the ferry system. Maybe next time. Wow Skagway looks like an interesting little town to visit. That ice cutting train looks pretty fierce. A visit to the red onion seems a must do. Can’t believe there were over 70 brothels back in the good old gold rush days! It is such a small compact town. I can’t even imagine where wall the brothels were located. What a fun place to visit! I love that old cemetery especially. And the train! I’ve wanted to go to Alaska but I’m not a fan of cruises. I would enjoy this land-based Alaskan adventure! We did two weeks in Alaska, one on the ship, the other over land. Both were special in their own way. Love tips of free activities! Hiking and seeing the waterfall is definitely my cup of tea! It’s one of our favourite things to do too. Oh, this looks absolutely up our alley! Love your pictures. It was a different experience, and not one really suited for my tween. I am hoping most of it went over her head. Hi Rhonda. Since I’ve been looking at John Heald’s videos about The Legends cruise to Alaska, I’ve been thinking about a cruise to Alaska. It’s just the cold I’m not sure. I always think about a cruise with sunshine and heat. We’ll see. If I did, I would take the train excursion myself. 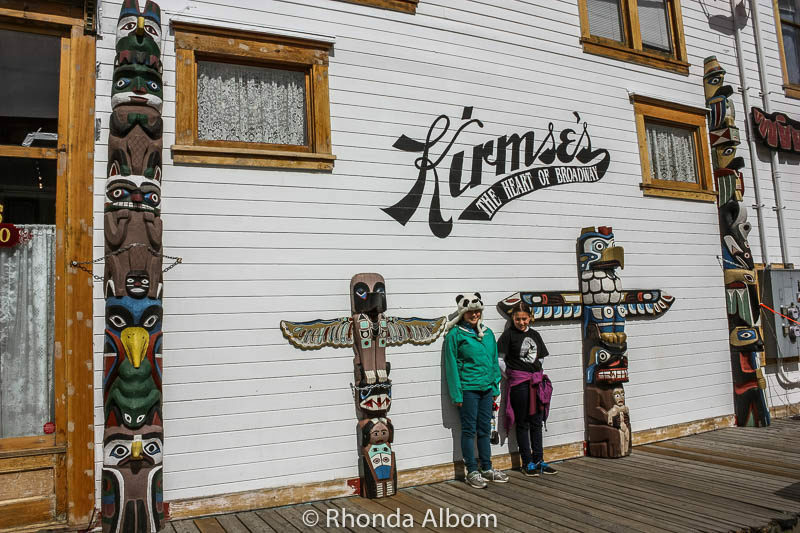 I really enjoyed you blog about Skagway. See ya my friend. It’s not that cold in the summer, it’s just not hot. It just takes a bit of looking and free things are everywhere. I would love to get to Alaska I’d love to cruise there! Cruising the interior passage is a display of nature at its best. Wow, Now that’s another world! Not sure this little Aussie will ever get to Alaska, but your photos are definitely gorgeous enough to whet the appetite. I got there, and I am your neighbour in New Zealand. What a fun day! There seems to be a little bit of everything in Skagway. I love the visitor’s center and the snow train. There was something to do for everyone, even the foodies. The Skagway Visitor’s Center is awesome with it’s 8000 driftwood pieces! I really enjoyed your pics though I shudder to think about the diseases running through that town when there were 15k men and only a few, very busy prostitutes in the Red Onion. Yikes! The visitor center is much more impressive live than in photos. As for the girls, there were 70 brothels in the prime of the gold rush. Free is a good price! Skagqay looks like one of those sleepy little towns that gets run over by cruise ship crowds every once in a while – in and of itself a great free thing to watch (did that in Fira, Santorini). 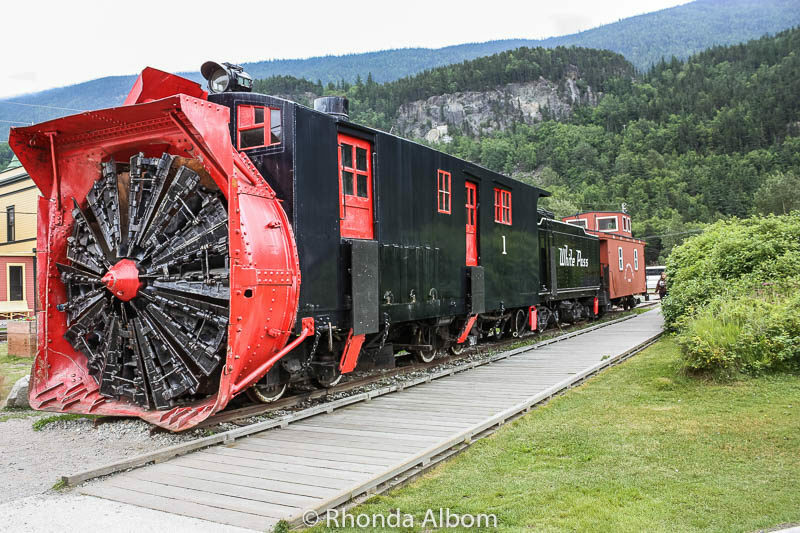 That snow/ice cutter on the train looks badass, like something out of Snowpiercer. Free is always a good price. And, yes this town does get overrun by cruise ships, but it keeps the economy going. That ice train looks amazing – I never knew such a thing existed!!! Thanks for all the great tips. I will get to Alaska one day!!! Alaska is amazing. I hope you do get there one day. I’ve always wanted to go to Alaska, and I am sure we will in the near future! I love how much character Skagway has! From the western store fronts to that crazy looking ice cutting train! I never heard of such a thing but it sort of looks like some crazy movie prop! Also, the view of the mountains is also a huge bonus! Great to know that there are so many free things to do as well! Everywhere we went in Alaska was like this, each town oozing with its own personality. There are free things to do most places, you just need to know where to look. Another reader replied on Twitter that they are in shape and found the Dewey Lake hike difficult. Wow that visitor center is amazing! Sounds like there is a lot to do in the town – definitely a place we’d like to stop whenever we get to Alaska. There is plenty to do in Skagway. I would love to go back someday. I think we would have taken the train had we not done Anchorage to Denali and back again just the week before. Nice post about Skagway! When we visited we took the train to the Yukon and then wandered the streets looking for geocaches and interesting stuff. Would have loved to have had this guide then! We geocache at home frequently, but we never think to do it when we travel. Fun idea. It’s far away from the rest of the country, and huge. Be sure to allow enough time. We had only two weeks, enough for a taste. If you are a photographer, I highly recommend lightroom. What a variety. I love the snow cutting train. I think the hiking trails and waterfall would beckon me. Yes, those were the things that called to us first. Have some friends that just moved to Alaska. I’ll miss them, but they love it there. Avid fishermen the both of them. While I loved Alaska, I am not sure I would be very happy there in winter. Thanks Melanie. Alaska is high on my list of the best places in the world. It is so lovely (in summer). I hope you get there. Check out some of my other Alaska posts. My number one change in what I did would be to start in Fairbanks and take the Denali Star to Anchorage, staying in Denali for a few nights. 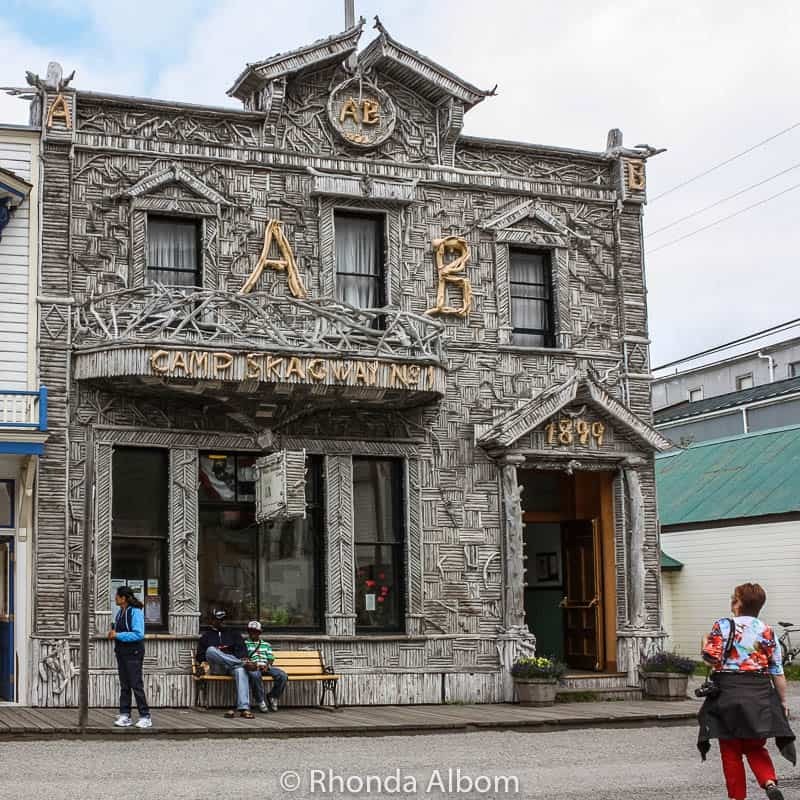 We spent three days in little Skagway – we took the train, watched the movie at the Historical Park, and a spent an entire rainy afternoon at the Skagway Brewing Company. At first, we were quite taken aback by how small it was and didn’t think we would be able to keep busy for our stay but it grew on us and it was one of my favorite stops on our ferry tour of Alaska. I would love to have spent more time in Skagway. It does feel as though there would be more than enough to do for days, so I am glad you confirmed this. I hope you do get there. Living here in New Zealand has spoilt us a bit, but there are still a few places that I think parallel the beauty, and Alaska is one of them. Looks like a very interesting place! I’ve never been to Alaska and I’d love to visit Klondike! Alaska is one of my favourite places, although I have only visited in the summer. Being that I am not a fan of winter, I don’t think I would love it in that season. I don’t think that type of train is still in use. They found that a plow on the front of the train is actually more efficient. We stopped in Skagway during our cruise and did the White Pass Railroad excursion. It was beautiful. This meant we didn’t have enough time to fully explore the town other than walking around and shopping. We’d love to return and explore this beautiful area one day soon. Like nearly all cruise ports, there just isn’t enough time to see it all. I am glad to hear you loved the railroad. I love Skagway! It was my favorite out of all the places we visited in Alaska. We spent our time there touring the town (including the resident campground where our tour guide lived) and drove up to the Canadian border to see the one and only Welcome to Alaska sign. I hope to return again someday. I wish I had had more time in Skagway. I would have loved to head up the Canadian border and see the sign. There was a lot of innuendoes. So many that I wondered if we should have brought our tween and teen on this tour. I loved Skagway! If I could have stayed in that port throughout our entire cruise, I would have. All other ports paled in comparison. My family hiked to the cemetery, back to town and to Yakutania Point- which was incredibly beautiful. We walked back just in time to see the seals arriving with the tide to feast on the salmon. I would have loved to see the seals eat the salmon. It looks so beautiful over there, lovely photos. Great tips as well, I for sure hope to visit one day. I hope you get to visit someday too. Our Alaska cruise was really special. Beautiful scenery. I’m glad you had fun. What’s on the front of that train? Was it used to clear snow on the tracks? I’ve updated the caption on the image. The train car was used to clear snow and ice.